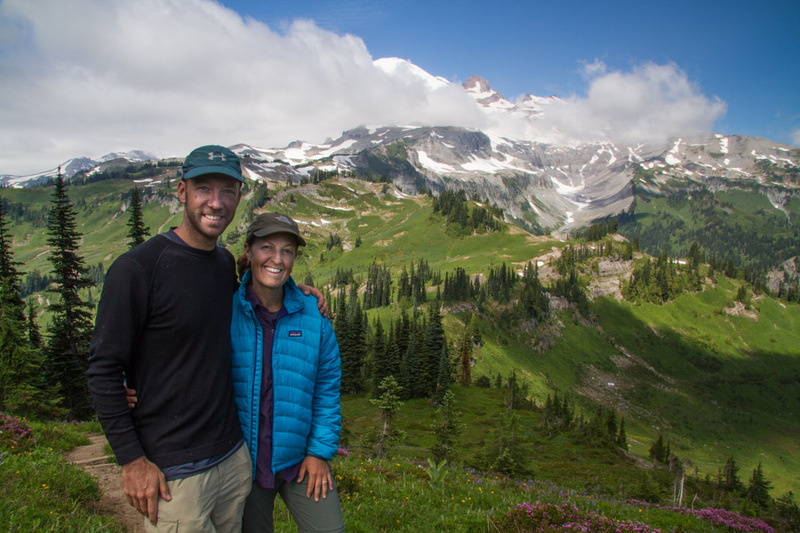 The east side of Mount Rainier was the final four-day segment of our Wonderland adventure, and, in many ways, it felt like we had saved the best for last. 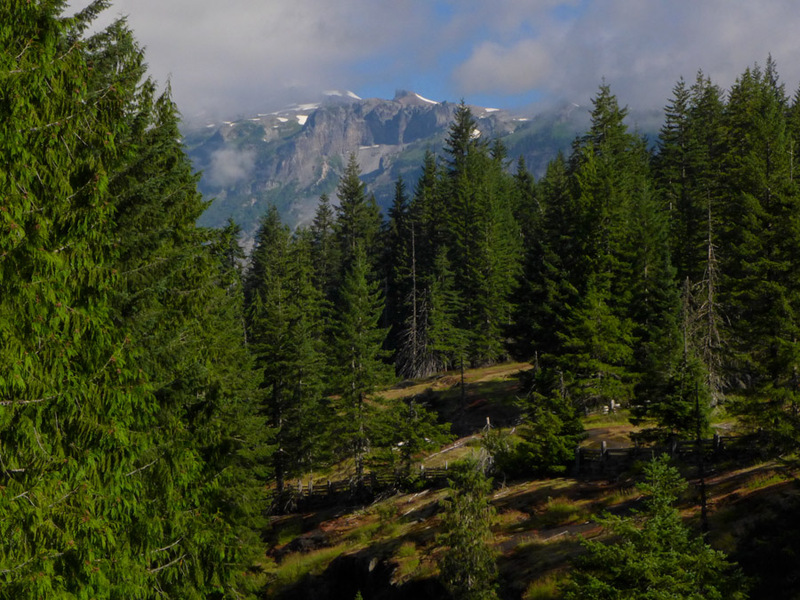 Beginning on the south side of the park, we admired many beautiful trail-side waterfalls in the forested lower elevations before climbing back into the higher elevations of the east where a veritable alpine paradise awaited us. Spending our last two nights on the trail at Indian Bar and Summerland, two of the most beautiful camps in the park (if not the entire country), was a fitting end to the amazing experience of completing the Wonderland Trail. 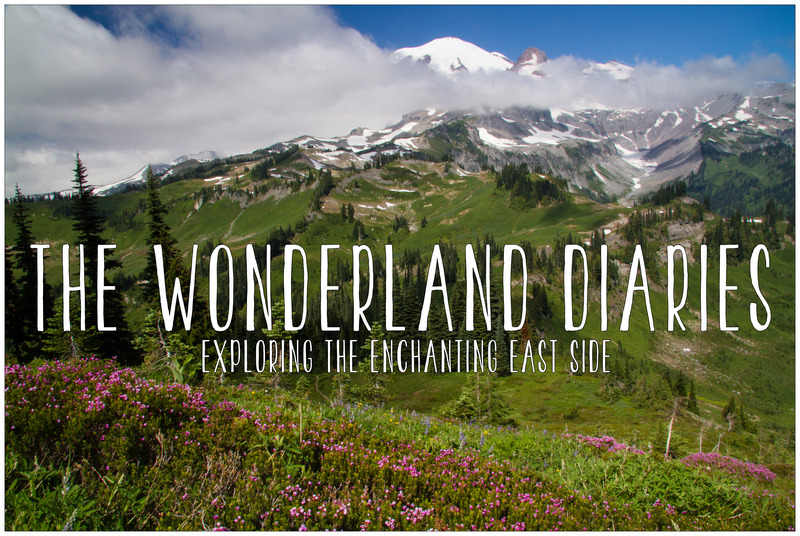 By the time we were through exploring Rainier’s enchanting east side, we wished we could turn around and do it all over again! 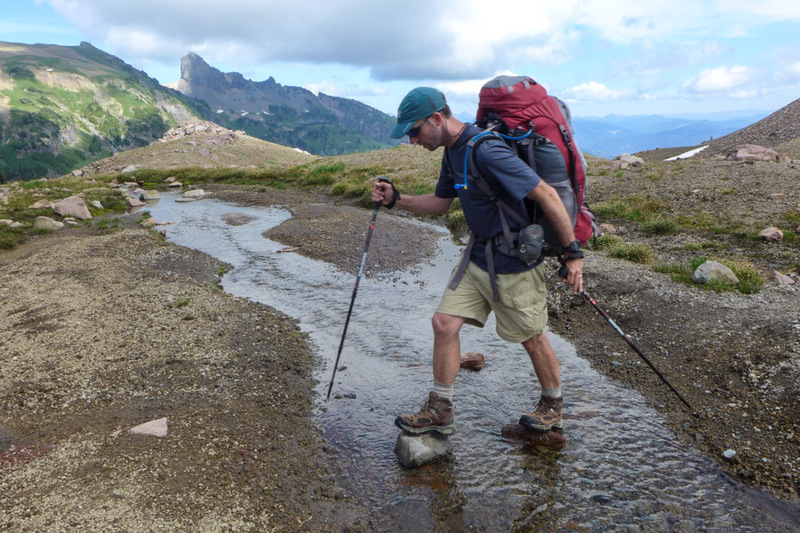 What follows is a detailed description of Days 9-12 on the trail. We hope that this first-hand information will be valuable to those planning this hike. If that’s not you, we hope that you’ll enjoy looking through the photos anyway. Happy trails! We awoke to a foggy morning with a heavy layer of mist and dew drenching everything. While the scene was atmospheric, it provided less than ideal packing conditions for our damp gear, and the extra water weight we were carrying due to the dew was definitely not appreciated. It was a steady uphill trek through the mystical forest to Narada Falls, a beautiful bridal veil-style falls that looked especially ethereal in the morning mist. We divided up the photography duties here; I focused on shooting the falls, while Matt concentrated on close-up work of the dew-covered foliage. Back on the main trail, it was slow-going. The condensation on the vanilla leaf, ferns and blueberry bushes proved too photogenic to pass up, and we moved at a snail’s pace stopping every few feet to snap photos of the attractive flora. After 2.0 miles, we finally arrived at Reflection Lake, one of the premier spots in the park to photograph reflections of Rainier, only to find that the mountain was nowhere to be seen. We stopped for a quick snack hoping that the blanket of clouds might lift to no avail. We did, however, run into a pretty doe in one of the meadows near the lake. Back in the woods, it was a moderate downhill to Martha Falls and then a gentle ascent through pine forest to Sylvia Falls. Though pretty, both falls proved difficult to photograph. By the time we finally reached Martha Falls, the sun had come out, and the lighting on the falls was too contrasty. Sylvia Falls, on the other hand, was completely shaded and looked strangely blue in the viewfinder. From Maple Creek, the trail paralleled Stevens Creek and stayed pleasantly level as we started the last of our high mileage days on the trail. 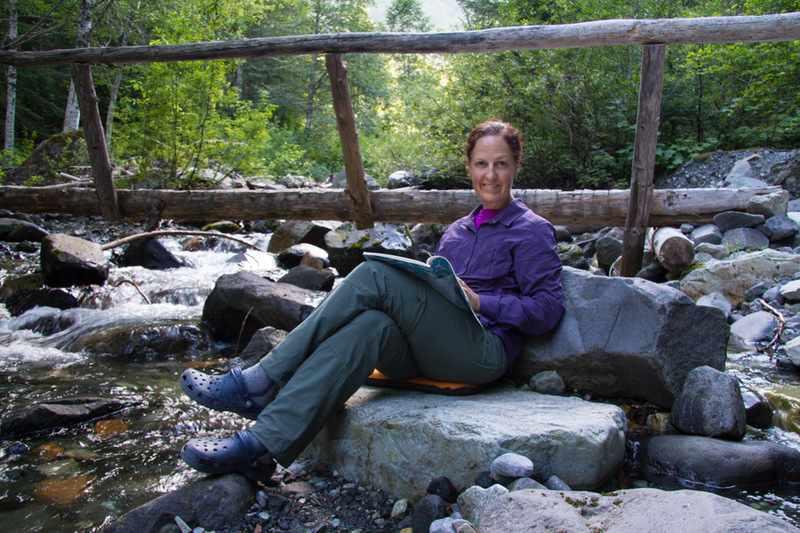 Shortly after leaving camp, we crossed the river on a sturdy bridge and stopped to admire a beautiful unnamed waterfall before tackling the gentle climb up to Box Canyon. Along the way, we caught our first glimpse of the mountain since leaving Longmire. We missed it! This gave us hope that even better views were in store for us ahead. After Box Canyon, it was a grueling uphill slog through the forest. The trail gained 2500 feet over 3 long miles that felt like they would never end. 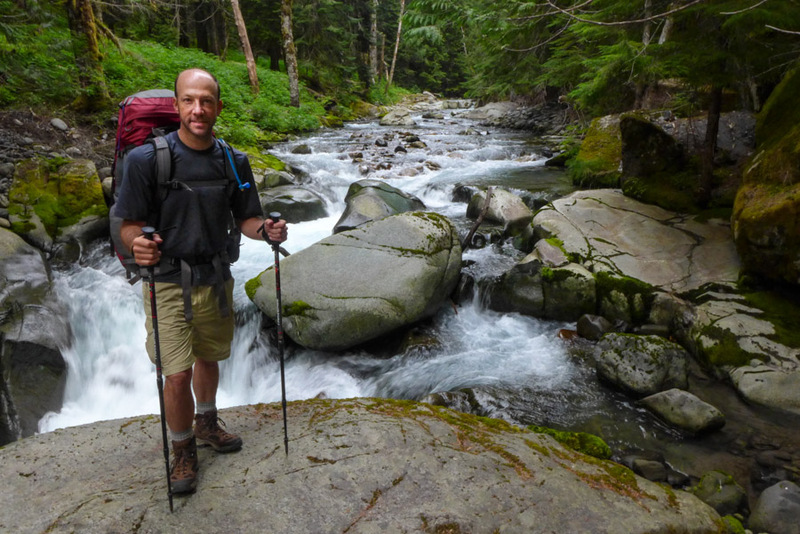 We looked for interesting distractions along the way to help take our mind off the climb and were relieved to finally break out of the forest and reach Cowlitz Divide. The trail leveled off a bit and meandered through grassy meadows. An enormous flat patch in the grasses caught our attention, and we wondered what hefty animal had used this soft space as its bed the night before. We were convinced it was a bear, but a ranger we met a bit farther down the trail suspected it was more likely an elk. As we gained altitude, the meadows became more beautiful. Impressive stands of bear grass flanked the trail with the jagged peaks of the Tatoosh range serving as a backdrop. We couldn’t stop ourselves from taking countless photos of the striking scenery. When we finally arrived at the high point of the trail (5930 ft), a thick layer of clouds had rolled in, and everything but the base of the magnificent Rainier was concealed. The trail dropped a steady 800 feet through alpine meadows where all of the usual suspects including lupine, neon pink paintbrush, heather, and hippies on sticks (the seed pod of the western anemone and a personal favorite) were out in full force. Eventually we got our first glimpse of the Indian Bar Valley (5120 ft), an idyllic spot for one of the Wonderland’s premier backcountry camps. A CCC-built shelter serves as the group site here, and there are four individual sites located across the bridge over Wauhaukaupauken Falls on a very vertical hillside overlooking the idyllic setting. By the time we arrived, only site #4 at the top of the hill was still available. We made the long slog up to the highest site and set up camp. The water source and bear pole were located at the camp’s base, while the privy-with-a-view and our tent site were at the top. Between completing camp chores and trips to the toilet, we added some serious mileage and elevation gains and losses to our already long day. We used our last few hours of daylight to explore the magnificent valley surrounding the camp. 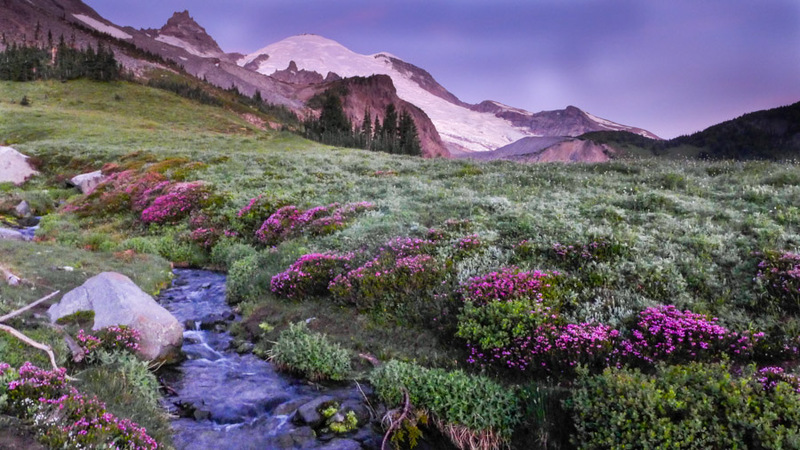 The alpine flowers were in peak bloom and made for terrific photo subjects while Rainier was still enshrouded in clouds. We explored the Indian Bar shelter, which was unoccupied for the night. This impressive stone shelter, built in the 1940s, contains wooden bunks suspended by rusty chains along the perimeter of the room. It must be fun to stay here with a group of friends and cozy up around the large stone fireplace to recount the day on the trail. 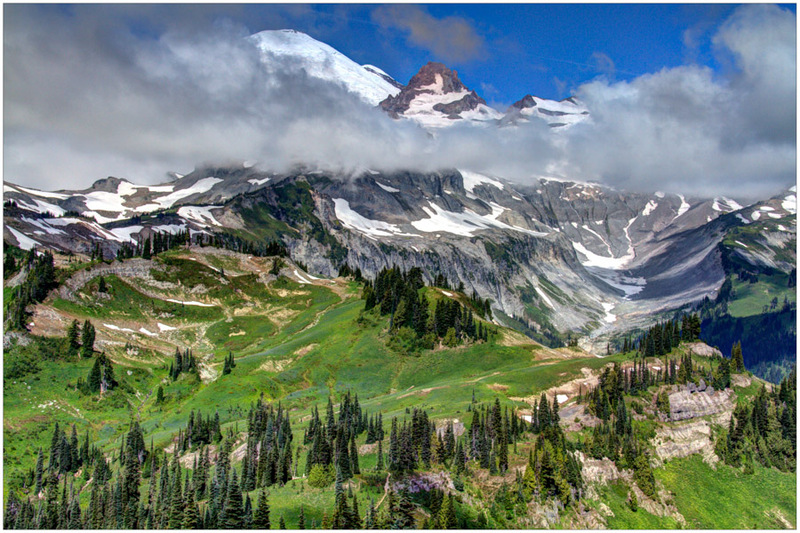 It is easy to see why Indian Bar Camp is one of the toughest backcountry permits to get on Rainier. In addition to other Wonderland hikers, you are also competing with Seattleites who use it as an ultimate weekend destination. Improve your chances of staying in this alpine paradise by timing your overnight stay on a weekday. With a short day ahead, we decided to spend the morning retracing our steps back up the trail to a vantage point overlooking Indian Bar in hopes of photographing the spectacular scenery under better conditions. Unfortunately, we woke up to find another thick layer of clouds enshrouding the mountain. But, with large pockets of blue sky around us, we were undeterred and started the steep 800 foot climb up to the commanding view of the mountain. Unfortunately, the higher we climbed, the less likely it seemed our efforts would be rewarded. We focused, instead, on an attractive patch of Indian paintbrush whose neon pink flowers called out like sirens in the thick morning mist. Back on the trail, conditions began improving. As the sun rose higher in the sky, it started burning off the clouds, and we had a renewed sense of hope. We climbed to a vantage point and got a few shots of the beautiful scene opening up before us. Not only could we see finally see Mount Rainier, but we were also fortunate to catch a glimpse of Mount St. Helens lit up by the morning sun. We lingered in the meadows, enjoying the warmth provided by the morning sun and even spotted a small ladybug with the same idea on her mind. After a few hours, we decided it was time to head back to camp, pack up and move along to Summerland. While we didn’t get the clear, unobstructed views that we were hoping for, we thoroughly enjoyed exploring this beautiful portion of the trail for a few extra hours without the burden of our heavy packs. 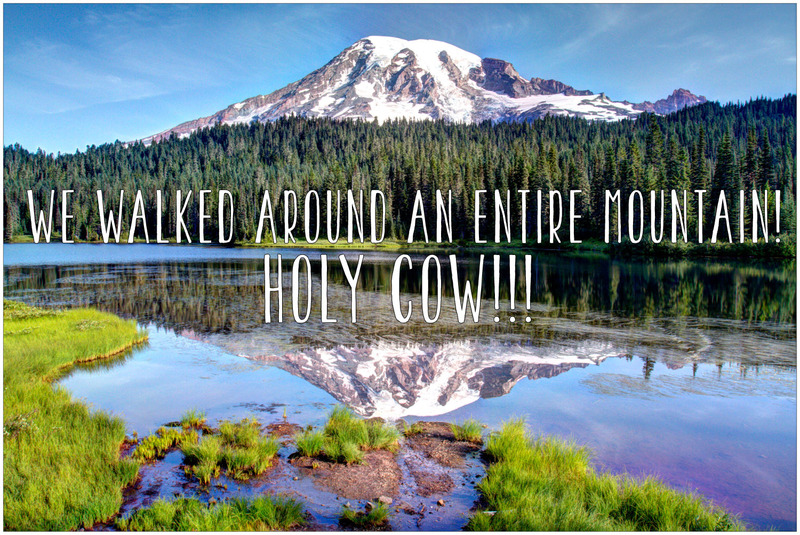 Unfortunately, we ran into some camera trouble on our way back to camp. Every time we tried to take a picture, our DSLR indicated that we had a problem with our lens. With know idea how to solve it, we reluctantly packed our camera away and made good time getting back to Indian Bar. After a quick lunch, we broke camp, bid farewell to Indian Bar and started making the arduous ascent to Panhandle Gap. The trail headed up the creek to an overlook of the valley. 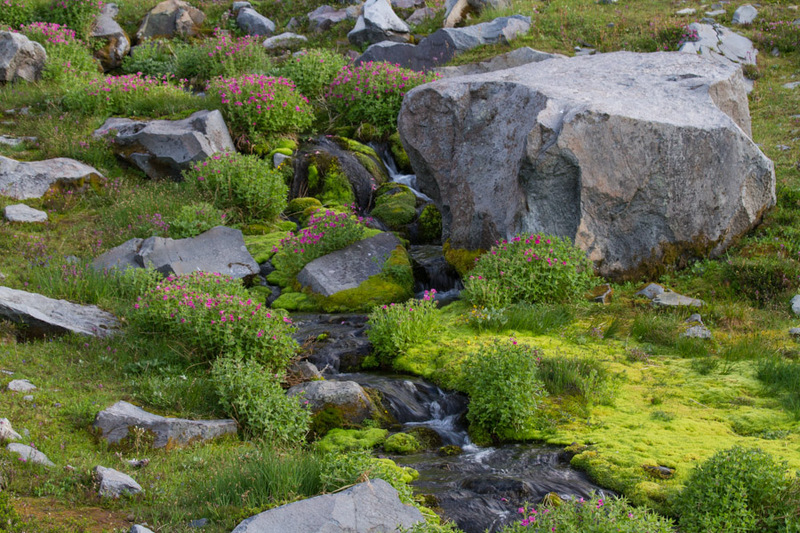 We followed the switchbacks through flowery meadows, enjoying occasional glacier views. Eventually the meadows gave way to slate and volcanic rock, and the scene became increasingly impressive. Above tree line, we hit some of the permanent snowfields that can make this section of trail quite tricky. We were relieved to find that the snowfields were on the smaller side this year, and post-holing through the slushy snow bridges was more of a concern than slipping and sliding on ice. Along the way, we enjoyed the magnificent views of Fryingpan Glacier, Mount St. Helen’s and Ohanapecosh Park where we spotted a herd of goats grazing in the distance. After a few hours, we finally reached Panhandle Gap, which at 6800 feet is the highest point on the Wonderland Trail. We crossed the saddle to look down on the Emmons Glacier, a turquoise seasonal lake and Summerland Camp far off in the distance. The trail descended steeply at first and crossed a few more snow fields before dropping into the neon green alpine meadows of Summerland (5940 ft), our last backcountry camp of the trip. 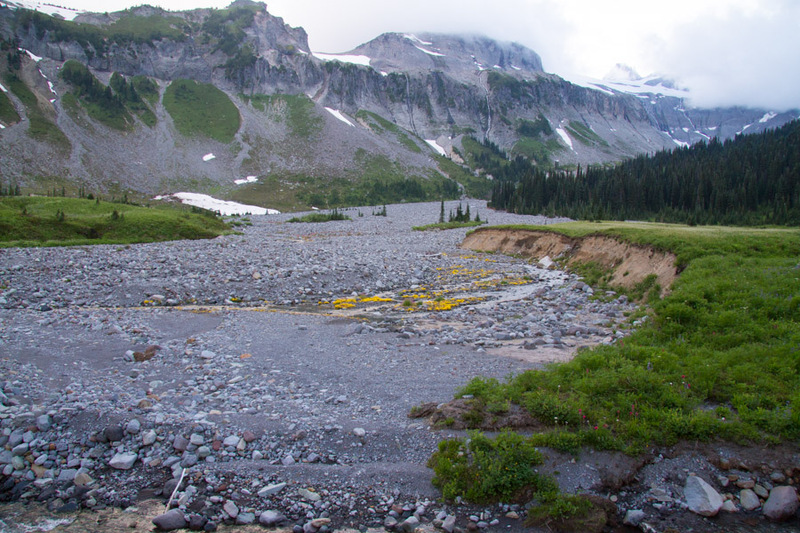 The area surrounding Summerland was very picturesque with pleasant meandering streams lined with monkey flower and pink heather, plump marmots frolicking about and close up views of Rainier and Little Tahoma. 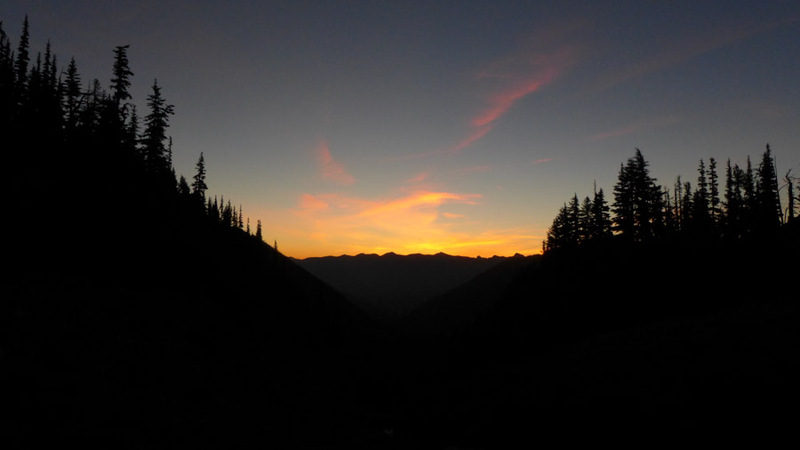 Summerland Camp is famous for its sunrises, so we woke up early hoping to catch some alpenglow. We braved the freezing temperatures early in the morning, but even with multiple layers on it wasn’t easy. By this point, our little Lumix point-and-shoot was running on fumes and ran out of juice quickly in the cold. With our DSLR’s 18-85 mm lens no longer functioning, we only had our 70-300 mm lens to shoot with, limiting our ability to get good shots. After breakfast and breaking camp, we headed back to the meadow for a final view. Summerland is aptly named for the profuse blooms that can be found here during the summer months. On our visit in the first week of August, we found the Lewis monkey flower in peak bloom. Sprawling bushes of the pretty pink blossoms lined the moss-covered streams, making this one of the most attractive patches of wilderness we had seen on the trail. Armed with our long lens, we had a chance to photograph some of the playful hoary marmots that call this meadow home. While we were there, a hiker happened to be perched on a large boulder playing a tin whistle, making the marmots in the area go nuts. We’re not quite sure what their take on his serenade was, but they were definitely intrigued to say the least! We got some great shots of the marmots posing on the rocks, and we enjoyed watching a family of little ones interacting with their mother. We then found a rock of our own, where we could spend a quiet moment to take it all in and say our final goodbye to Tahoma. Just as we donned our backpacks and headed out of camp, the day hikers and trail runners started arriving in hordes. It was a Saturday, and we passed what seemed like a million hikers on our 4.1 mile descent along the Frying Pan Creek Trail until the junction where the Wonderland Trail splits off and heads back to White River Campground. The last 2.6 miles of the trail were quieter and more like what we had grown accustomed to over the past twelve days. We walked along enjoying our final moments of solitude in the woods. All too soon we crossed the last set of log bridges over the White River that led us back to our car some 12 days and 93 miles from when and where we started. Marvelous photography, and we especially like the photo of you two. Will all this be a book one of these days? Hope so…. Thanks, Judy! Unfortunately, we don’t have any book deals in the works, but an online hiking magazine is going to publish the whole trip in the near future. You can look for it at: http://www.visitsidewalk.com/home. Thanks for stopping by and for all of your encouragement. We really appreciate it! Congratulations, Sandra! 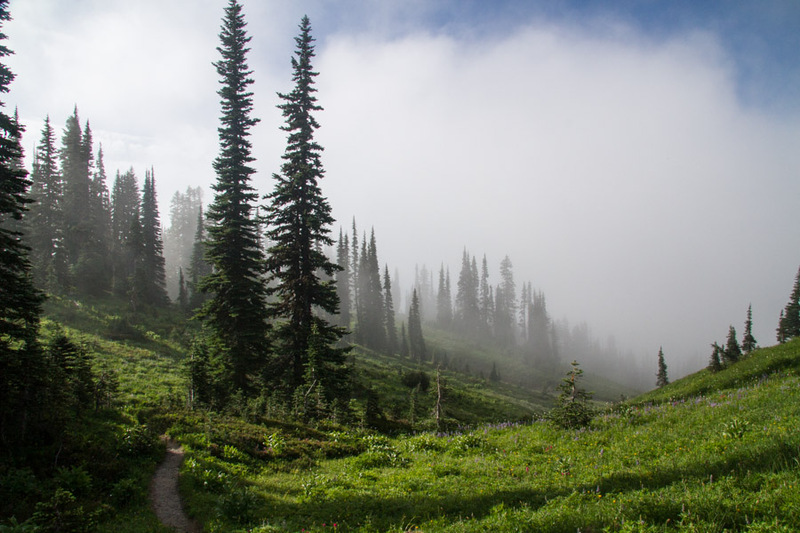 You are going to have a fantastic time on the Wonderland Trail and having a permit in hand now will definitely ease some of the stress of gearing up for this great adventure. Please feel free to reach out if you have any questions. Time to start training, right? Happy trails! Start training…lol…I started the beginning of February. It’s all about positive thinking, right? 🙂 I certainly will give you a shout if I run into any questions. Here is one…bear spray – take it or leave it? Good question. 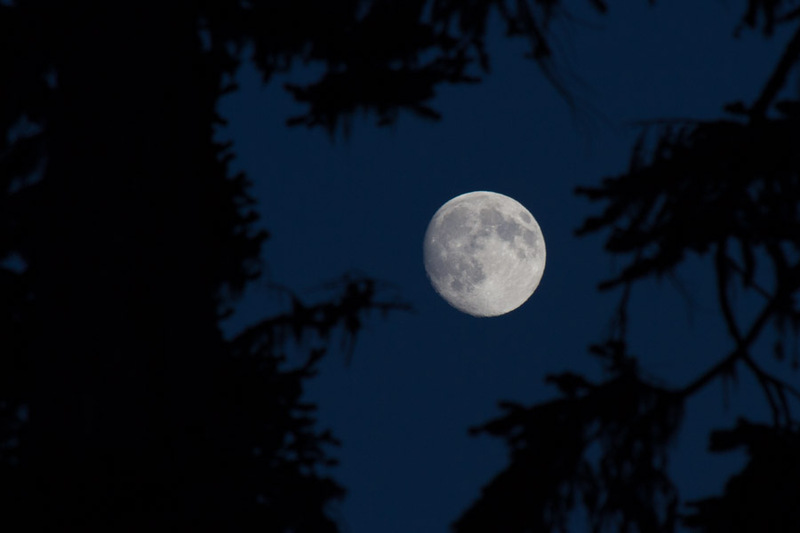 We did not carry bear spray and never have, even though I am really afraid of running into bears, especially at night. 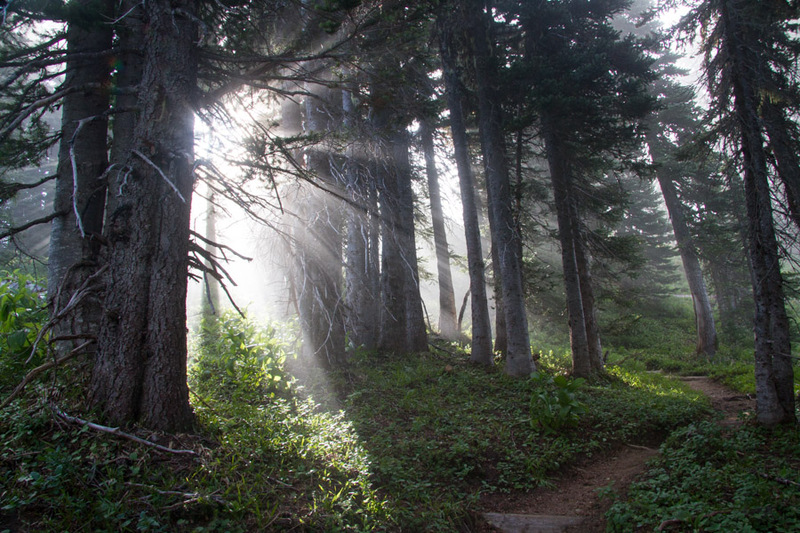 If bear spray will give you peace of mind and allow you to enjoy your hike more, definitely bring it. I will say that we ran into bears 3 times on the WT, and, each time, the bears hardly paid us a bit of attention, which was such a relief! We wish, Andy! Oh, how we wish!!! What time of year did you go. Awesome shots ! Thank you! We were there in late July/early August, which was perfect timing that year for the wildflowers. I think you would get spectacular photos at any time of year, though. The whole park is gorgeous! Are you planning on doing the trail?